SPECTACULAR VACATION HOME. … You’ll love everything about this gorgeous, professionally decorated vacation home … the new renovation, the beautiful décor, the location and the spectacular mountain and fairway views from the back patio! This property has everything on your wish list! Beautiful hard wood floors have been used throughout the main living areas of this home and as a feature wall in the great room. All three bedrooms are carpeted. In the great room, comfortable furnishings surround a huge mounted flat screen cable TV providing plenty of room for entertaining family and friends. A lovely office and reading area have been tucked into one corner of the great room and provides a perfect space for your laptop and conducting personal business during your short or extended stay. The dining area off the kitchen provides formal dining for six and there is a butcher top bar area in the kitchen that provides casual dining for four. The kitchen has been newly updated and all kitchen supplies are new (summer 2015). Through the kitchen windows you’ll spy the western mountain and fairway views, or step out onto the extended back patio to take in the stunning panorama. The patio has been exceptionally well furnished with stainless gas BBQ, dining area, chaise lounges and bar area … everything you need for a sunset dinner al fresco. The master suite has been beautifully furnished with a king bed, luxurious bedding, comfortable reading chair, flat screen cable TV and features a private en-suite with his and hers sinks and walk-in shower. Both guest bedrooms have been furnished with queen beds, luxurious bedding and flat screen cable TVs. The recently updated guest bathroom has a single sink and shower/tub combination. The updates and furnishings of this vacation home have been a labor for of love for the new owners and all the furnishings and amenities were selected with vacationing guests in mind. Rarely do you find this level of quality in a vacation home. This property is an end unit, 30 plan with Western views from the back patio and Southern views from the kitchen, dining room and two bedroom windows. A pool and spa are located just behind the condos across the street … a very close walk but not close enough to hear any pool noise. The property is on a quiet cul-de-sac street close to the back gate and within an easy walk to the College of the Desert Weekend Street Fair. Wi-Fi and free local, US and Canada call provided. Please no smoking and no pets. NOTE: Rancho Las Palmas has discontinue their use of transponders for gate access. They have been replaced with RFID Tags that are affixed to vehicle headlights. The RFID Tags allow entrance through both the front AND back gates of Rancho Las Palmas are only available to renters of 60 days or longer. RFID Tags will NOT be issued to short term renters of less than 60 days. All renters will be issued a GATE PASS upon initial entry into Rancho Las Palmas. The gate pass allows entry through the front gate off Bob Hope Drive only. 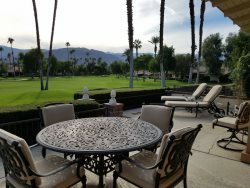 For renters of 60 days or longer, Rancho Las Palmas Country Club gives our renters the option of purchasing a RFID Tag at the cost of $50 for the duration of their stay. An appointment is required along with a copy of the rental agreement that contains the renter’s name, property address, dates of arrival and departure and a check or money order for $50. This is completely optional and is a cost to the renter. Alternately, renters can use the GATE PASS issued to all renters and enter through the front, Bob Hope Drive gate. Everyone at Vacation Rentals of the Desert is great. Very easy to work with and very responsive. We have stayed at this particular property for three years in a row and will definitely stay again if it is available. Very happy with everything. We have worked with Vacation Rentals for many years and they are very easy to work with....from the beginning to the end. I have recommended them to family members. Love everything about the property and the rental company. We have worked with Vacation Rentals of the Desert for many years now and have referred other members of my extended family, who have also rented from them. Vickie and Trish are always friendly and very easy to work with.